Using publicly available data, we examined Australian firearm death rates before and after the Port Arthur massacre and the gun law reforms it precipitated to explore the hypothesis that the introduction of the gun laws was associated with an accelerating decline in deaths caused by firearms. We also examine all-cause homicides and all-method suicides in order to assess the possibility that substitution effects may have occurred: that reduced access to firearms may have caused those with homicidal or suicidal intent to use substitute methods. Data on unintentional (accidental), and intentional (suicide and homicide) deaths caused by firearms were obtained from the National Injury Surveillance Unit,6i sourced from the Australian Bureau of Statistics (ABS) mortality data collection 1979–2003, coded as International Classification of Diseases, 9th revision and 10th revision. This represents a census of all firearm deaths in Australia for those 25 years. In all Australian jurisdictions (state and territory Firearms Acts and Regulations), at federal level (the Customs Act and Regulations) and in the ABS mortality collection, “firearm” includes guns whose projectiles are propelled by compressed air or gas. Although we know of no such fatalities, any deaths from airguns or ball bearing guns would be included in this dataset. Population data were obtained from the ABS for the same period. Firearm death rates per 100 000 were then calculated. The trend in these rates for the 18 years up to and including the year in which the new firearm laws were announced (1996) were compared with the corresponding trend for the next 7 years (1997–2003), to examine the hypothesis that the announcement and implementation of the gun laws were associated with an acceleration in the existing decline in firearm homicides, firearm suicides and total firearm deaths. Fatal “legal intervention” shootings by police, which averaged 4.5 per annum, were excluded as they were not targeted by the gun laws in question. For the post-Port Arthur period, rates of total all-cause (and non-gun) homicides and suicides were also examined, to consider whether perpetrators may have substituted other means of killing if the gun laws reduced their access to firearms. Numbers of deaths by category (total and components) have been viewed as arising from an overdispersed Poisson process and analyzed using negative binomial regression, with annual Australian population estimates used as an offset. In practical terms, the model views deaths as a number of events per head of population, although for convenience we report rates per 100 000 heads of population. The model has been used to estimate the change in trend of the relative rate of firearm deaths associated with the introduction of uniform gun laws. 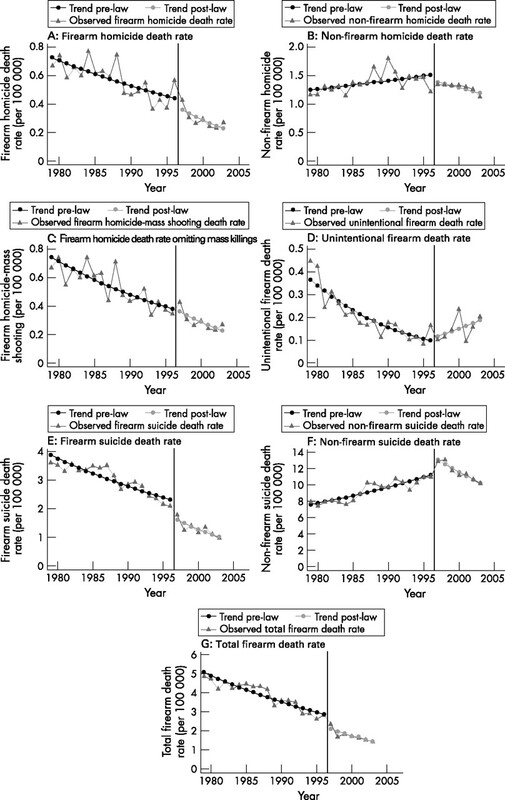 Given that the rate of firearm deaths had been decreasing before the harmonization of gun laws, the statistical question addressed is not just whether death rates were lower after the laws were changed, as the pre-existing trend would predict this even in the absence of changed laws, but whether the rate of decrease in firearm deaths seems to be greater after the gun laws were announced. Given the observational nature of the data available, we can directly comment on the association of gun law harmonization and firearm-related death rates, but conclusions regarding causality of the association must remain interpretive rather than definitive. However, as it would be politically almost inconceivable that any government would conduct a randomized controlled trial of gun law effects, the evidence presented must be among the best that could ever be available to deal with the question of the effects of such law reform. As counts are of deaths, it is reasonable to assume that observations are independent across years. Three models have been fitted for each type of firearm death. estimates the ratio of trend after introduction to that before the introduction of the gun laws. Trends and relative trends have been reported as relative rates (before and after 1996) and relative trends (comparing periods) with 95% confidence intervals. The statistical significance of the relative trends has also been reported. Analysis has been undertaken separately in firearm-related and non-firearm-related deaths as well as total deaths for homicide and suicide to investigate possible substitution effects. If substitution occurred, we would expect an increasing downward trend in firearm deaths after the introduction of gun control laws but a compensatory lesser downward or even upward trend in non-firearm-related deaths over the same period. The extent of influence of mass shootings has been investigated by repeating firearm-related homicides excluding mass (⩾5 victims died) shootings. An alternate view of these data might have been as a time series of mortality rates, as was done by gun lobby affiliated researchers Baker and McPhedran.7 However, we saw two disadvantages to this approach. One is that calculating mortality rates and then treating them as a number in a time series ignores the natural variability inherent in the counts that make up the numerator of the rate. Another is that the Box–Jenkins class of models, including the auto-regressive integrated moving average model used by Baker and McPhedran,7 is unable to explicitly address the effect of an intervention such as the introduction of gun laws. Interpretation of these models is reduced to comparing the mortality rates expected under a model assuming no effect of the intervention with that observed, both in the post-intervention period. This is however an insensitive approach, and its interpretation is not based on formal statistical inference but rather on visual inspection and qualitative interpretation of graphs, which may be prone to selectivity. The second author has archived reports of all mass shooting incidents in Australia (defined here as when ⩾5 victims died; table 1). These were used to compare the incidence of such shootings before and after the introduction of the new gun laws. In the 18 years up to and including 1996, the year of the massacre at Port Arthur, Australia experienced 13 mass shootings. In these events alone, 112 people were shot dead and at least another 52 wounded (table 1).8 In the 10.5 years since Port Arthur and the revised gun laws, no mass shootings have occurred in Australia. Figure 1 comprises seven graphs plotting both pre-law and post-law data and trends for (a) firearm homicide death rate, (b) non-firearm homicide death rate, (c) firearm homicide minus mass shootings death rate, (d) unintentional firearm death rate, (e) firearm suicide death rate, (f) non-firearm suicide death rate and (g) total firearm death rate. (A–G) Total firearm deaths (excluding “legal intervention” (police shootings)), firearm homicides and suicides, unintentional firearm deaths, total homicides and suicides; rates per 100 000, Australia 1979–2003. Note that the total firearm deaths include deaths of undetermined intent as shown in table 2. Each graph presents the observed annual death rate (triangles) and the expected death rate under the hypothesis of an effect of gun laws (dots) estimated from a negative binomial model. The vertical line on the horizontal axis indicates the revision of gun laws commencing in 1996. An interpretive note that applies to all the graphs in fig 1 is that the shape of fitted lines (trend pre-law and trend post-law) involves two components. The first is that the post-law trend line is shifted upward or downward according to the underlying rates of mortality in the pre-gun law and post-gun law periods. Where there is a pre-existing downward trend in mortality, such a shift would occur regardless of the effect of gun laws. The more interesting component is how much the slopes of the pre-gun law and post-gun law trends differ. Although it can be difficult to judge the magnitude from the graph itself, this is quantified in the final column of table 3, which provides estimates of the relative slopes of the post- to pre-law trends. Table 2 shows that gun-related deaths (both in numbers and as a rate per 100 000) had been steadily falling throughout the years before the new gun laws were announced. In the 18 years (1979–96), there were 11 299 firearm deaths (annual average 627.7). In the 7 years for which reliable data are available after the announcement of the new gun laws, there were 2328 firearm deaths, (annual average 332.6). Figure 1G and table 3 indicate that although the rate per 100 000 of total firearm deaths was reducing by an average of 3% per year, this rate doubled to 6% after the introduction of gun laws. The ratio of trend estimates differed statistically from 1 (no effect; p = 0.03). The decline in total firearm deaths thus accelerated after the introduction of the gun laws. Firearm suicides represent the largest component cause of total firearm deaths in Australia (more than three in four of all firearm deaths). In the 18 years (1979–96), there were 8850 firearm suicides (annual average 491.7). In the 7 years for which reliable data are available after the announcement of the new gun laws, there were 1726 firearm suicides, an annual average of 246.6. Figure 1E and table 3 indicate that while the rate of firearm suicide was reducing by an average of 3% per year, this more than doubled to 7.4% per year after the introduction of gun laws. The ratio of trend estimates differed statistically from 1 (no effect; p = 0.007). Again, we conclude that the decline in total firearm suicides accelerated after the introduction of the gun laws. In the 18 years (1979–96), there were 1672 firearm homicides (annual average 92.9). In the 7 years for which reliable data are available after the announcement of the new gun laws, there were 389 firearm homicides, an annual average of 55.6. Figure 1A and table 3 show that while the rate of firearm homicide was reducing by an average of 3% per year, this increased to 7.5% per year after the introduction of gun laws. However, the ratio of trend estimates failed to reach statistical significance (p = 0.15) because of the low power inherent in the small numbers involved. When all firearm mass homicides (⩾5 victims shot dead per incident) were removed from the data (fig 1C and table 3), the conclusions were only slightly altered. The reason for this slight change is that all mass shootings in Australia in the years studied occurred before the introduction of gun laws (table 1). This increases the apparent downward trend in the pre-gun law period (0.971 when all homicides are considered, v 0.961 when mass shootings are removed, table 3). The trend in the post-gun law period is unaffected. Unintentional (accidental) firearm deaths have always been the smallest component of the total firearm deaths in Australia, representing around 6% of all firearm deaths. Figure 1D and table 2 indicate that although the rate of total gun deaths reduced by an average of 7.6% per year, the rate of unintentional gun deaths actually increased by 8.5% per year after the introduction of the gun laws. We discuss this finding below. Figure 1B and table 3 indicate that the rate of total non-firearm homicides increased by an average of 1.1% per year before the introduction of the gun law and reduced by an average of 2.4% per year after the introduction of the gun laws (see row 3, columns 2 and 3, respectively, in table 3). The ratio of the pre-law to post-law trends differ to a significant extent (p = 0.05). Table 2 also shows the total homicides (by all methods) for the period 1979–2003. In the pre-gun law period, total non-firearm homicides were essentially stable and did not differ from steady state to a statistically significant extent (table 3). After the introduction of gun laws, a significant downward trend was evident in total homicides, and the ratio of pre-law to post-law trends differed statistically from “no effect” (p = 0.01, table 3). We conclude that the data do not support any homicide method substitution hypothesis. Figure 1F and table 3 indicate that the rate of total non-firearm suicides increased by an average of 2.3% per year before the introduction of the gun law and reduced by an average of 4.1% per year after the introduction of the gun laws (see row 6, columns 2 and 3, respectively in table 3). The ratio of the pre-law to-post-law trends differs statistically (p<0.001). Table 2 also shows total suicides for the period under review. Total suicides follow a similar pattern as total non-firearm homicides. In the pre-gun law period, total suicides were essentially stable (table 3). After the introduction of gun laws a significant downward trend was evident in total suicides and the ratio of pre-law to post-law trends differs statistically from “no effect” (p<0.001; table 3). We conclude that the data do not support any suicide method substitution hypothesis. In all, total suicide (all methods including firearms) increased by an average of 1% per year before the introduction of the gun laws and decreased by an average of 4.4% per year after the introduction of the gun laws, whereas, total homicide (all methods including firearm) was essentially steady (decreasing by an average of 0.1% per year) before the introduction of the gun law and decreased further by 3.3% per year after the introduction of the gun law. The ratio of the pre-law to post-law trends reaches statistical significance for both total suicide (p<0.001) and total homicide (p = 0.01; table 3). In the 10.5 years which followed the gun buy-back announcement (May 1996–October 2006), no mass shootings have occurred in Australia. As one study on the Australian firearm buy-back notes: “Given that mass murders cause so much community fear, it is appropriate to choose this as an evaluation outcome separate from homicide rates generally.”11 Yet, in a recent paper examining the same dataset,7 two authors with declared affiliations with firearm advocacy groups failed entirely to report on this fundamental outcome, and issued press releases headlined Gun Laws Failed to Improve Safety and New Research Vindicates Gun Owners.12,13 Given that the banning of semi-automatic rifles and pump-action shotguns was premised on the explicit objective of reducing the likelihood of mass shootings, such a flagrant omission from their analysis is extraordinary. We suggest an analogy here. If a government addressed a recurrent incidence of level crossing car/train collisions by mandating alarmed barrier gates, it would be appropriate to ask two questions when later evaluating the effect of such a measure. One could ask “Have there been fewer level crossing car/train collisions and fatalities?” and “Have there been fewer road toll deaths from any cause?”. The outlawing of rapid-fire rifles and shotguns in the revised Australian gun laws was the equivalent of level crossing barrier gate legislation: its primary intention was to reduce mass shootings, a national concern after the Port Arthur massacre. Accelerating the reduction in overall firearm deaths—as occurred—is a bonus, particularly as the data show that there is no evidence of method substitution for either suicide or homicide. Three categories dominate firearm death data in Australia: suicide, homicide and unintentional (accidental) shootings. Suicide is the leading category, with an average of 79% of all firearm deaths each year. Firearms have a high lethality index (or “completion rate”) in both homicide and suicide.14 Had the gun law reforms not occurred, more Australians contemplating suicide—in particular, impulsive young people—might have more easily found a method of instant completion. Reliable national data on suicide attempts are not available in Australia to examine whether suicide completion rates changed after Port Arthur. However, the data show that the declining rate of suicide by firearms accelerated significantly after the 1996 gun laws, with there being no apparent substitution by other methods. As only a single shot is involved in most firearm suicides, it might be argued that reduced access to rapid-firing semi-automatic weapons would be irrelevant in policies designed to reduce suicide: a person intending suicide with a firearm need use only a single-shot gun. However, a person attempting suicide might just as easily use any available gun, including one capable of firing rapidly. The removal of more than 700 000 guns from an adult population of around 12 million therefore may have reduced access to guns among potential suicide attempters. However, many gun owners own >1 firearm and may well have handed in the newly prohibited weapons after the new laws required this, but retained their non-prohibited weapons. This means that although 700 000 firearms were removed from the community, the number of persons (and households) with access to (still legal) firearms is unlikely to have reduced significantly. What can be said with certainty though is that 700 000 fewer guns were available to be stolen or otherwise leaked from lawful owners to criminals. The finding that there was a significant increase in unintentional (accidental) firearm deaths after the new gun laws is perplexing, although it should be emphasized that the numbers involved in this increase are small. The average annual increase in unintentional firearm deaths in the 7 years since 1996 was just 1.4 deaths. We can conceive of no plausible hypothesis as to why the removal of more than 700 000 guns from the population, the introduction of firearm registration and the tightening of shooter licensing procedures would be associated with an increase in unintentional fatal shootings, however small in number. It would also be negligent to omit what seemed plain to Australians, but could be less easy to measure in empirical terms. After the death and serious injury of 54 people at Port Arthur, facilitated by firearms then openly marketed by licensed gun dealers as “assault weapons”, a national upwelling of grief and revulsion saw pollsters reporting 90–95% public approval for stringent new gun laws.20,21 Resistance to gun control was roundly condemned in virtually all news media,22 and governments’ 12 days of resolve deprived the firearm lobby of crucial delay time. Announcing the law changes, Prime Minister John Howard invoked the majority will of Australians when he said “This represents an enormous shift in the culture of this country towards the possession, the use and the ownership of guns. It is an historic agreement. It means that this country, through its governments, has decided not to go down the American path ... Ours is not a gun culture, ours is a culture of peaceful cooperation.”23,24 Later opinion polling ranked Howard’s new gun laws as by far the most popular decision in the first year of his conservative government.25 In the opinion of the authors, the 1996 sea change in Australian attitudes—and perhaps also a significant component of the public health benefits of lower rates of firearm-related mass shootings, suicide and homicide reported here—is best described as a national change of attitude to gun owners and their firearms. Table 2 shows that across the 25 years, there were 200 firearm deaths classified as being of undetermined intent. Of these, 157 (80.1%) occurred before 1991, and only 15–23 after 1996. (To preserve victims’ privacy, publicly released data for years in which there are ⩾3 firearm deaths of undetermined intent are recorded as NA. This was the case for 4 of 7 years between 1997 and 2003, meaning that there could have been a maximum of 12 and a minimum of 4 undetermined cases in this time.) Across the study period, firearm deaths of unknown intent comprised 1.3% of all firearm deaths, falling to 0.8% after 1990 and 0.4% after 1996. The decrease in “unknowns” is attributed to improved reporting practices. These “missing data” from the component analyses of firearm suicide, homicides and unintentional deaths may account for small variations in the results shown, were their status able to be known. Although ABS mortality data were also available for 2004, the National Injury Surveillance Unit warned of significant questions of accuracy due to the number of coroners’ cases not closed at the time, and potential miscoding of suicide, homicide and unintentional firearm-related death in that year.26 Accordingly, this study ends with 2003, the most recent year of reliable data. The data swings shown are so obvious that if one were given the data in table 2 and were asked to guess the date of a major firearm intervention, it would be clear that it happened between 1996 and 1998. The Australian Firearms Buyback remains the world’s most sweeping gun collection and destruction program.27 A combination of laws making semi-automatic and pump-action shotguns and rifles illegal, paying market price for surrendered weapons, and registering the remainder were the central ingredients. The Australian example provides evidence that removing large numbers of firearms from a community can be associated with a sudden and ongoing decline in mass shootings and accelerating declines in total firearm-related deaths, firearm homicides and firearm suicides. A radical gun law reform occurred in Australia after a gun massacre (35 dead and 18 seriously injured) in April 1996. Semi-automatic and pump-action shotguns and rifles were banned; a tax-funded firearm buyback and amnesties saw over 700 000 guns surrendered from an adult population of about 12 million. The total firearm deaths, firearm homicides and firearm suicides had been falling in the 18 years preceding the new gun laws. In all, 13 mass shootings were noticed in the 18 years preceding the new gun laws. In the 10.5 years after the gun law reforms, there have been no mass shootings, but accelerated declines in annual total gun deaths and firearm suicides and a non-significant accelerated decline in firearm homicides. No substitution effects occurred for suicides or homicides. We thank Renate Kriesfeld, National Injury Surveillance Unit, South Australia, for providing data. We also thank our three reviewers for their extremely helpful reviews. Commonwealth Attorney-General’s Department, Australia. The Australian Firearms Buyback: tally for number of firearms collected and compensation paid. Canberra: CAGD, 2002. Giles T. Amnesty tally 40 000 guns. Herald-Sun. Melbourne, 22 April 2002. Ozanne-Smith J, Ashby K, Newstead S, et al. Firearm related deaths: the impact of regulatory reform. Inj Prev 2004;10:280–6. Customs (Prohibited Imports) Regulations 1998; Regulation 4F. In force under the Customs Act 1901. Alpers P, Twyford C. Small arms in the Pacific. Occasional Paper No 8. Geneva: Small Arms Survey, 2003, 74–80. http://www.smallarmssurvey.org/files/sas/publications/o_papers.html (accessed 13 Nov 2006). Kreisfeld R. Firearm deaths and hospitalisations in Australia. NISU Briefing. Adelaide: National Injury Surveillance Institute, Australian Institute of Health and Welfare, 2005, 2. http://www.nisu.flinders.edu.au/briefs/firearm_deaths_2005.pdf (accessed 13 Nov 2006). Baker J, McPhedran S. Gun laws and sudden death. Did the Australian firearms legislation of 1996 make a difference? Br J Criminol 2006. Advance access 18 Oct. doi: 10.1093/bjc/921084. Alpers P. Mass gun killers: ten-year survey challenges myths. Mental Health Quarterly. Wellington: New Zealand Mental Health Foundation, 1996:22–3. Denholm M. Howard vow on gun law massacre in Tasmania. Daily Telegraph. Sydney, 30 Apr 1996. Howard J. Never, ever again. Prime Ministerial Op-ed. Herald Sun. Melbourne, 10 May 1996. Reuter P, Mouzos J. Australia: A massive buyback of low-risk guns. In: Ludwig J, Cook P, eds. Evaluating gun policy: effects on crime and violence. Washington, DC: Brookings Institute, 2003:141. McPhedran S. Study: gun laws failed to improve safety. Media release. Ballarat: International Coalition for Women in Shooting and Hunting (WiSH), 2006. Baker J. New Research Vindicates Gun Owners. Media release. Adelaide: Sporting Shooters Association of Australia (SA) Inc, 2006. Beaman V, Annest JL, Mercy JA, et al. Lethality of firearm-related injuries in the United States population. Ann Emerg Med 2000;35:258–66. Kellermann AL; Rivara FP, et al. Validating survey responses to questions about gun ownership among owners of registered handguns. Am J Epidemiol 1990;131:1080–4. Australian Institute of Criminology. Australian Crime: Facts and Figures 2001. Canberra: Australian Institute of Criminology, 2002, 20. http://www.aic.gov.au/publications/facts/2001/facts_and_figures_2001.pdf (accessed 13 Nov 2006). Reuter P, Mouzos J. Australia: a massive buyback of low-risk guns. In: Ludwig J, Cook P, eds. Evaluating gun policy: effects on crime and violence. Washington, DC: Brookings Institute, 2003:130. Mouzos J. Homicide in Australia. 2003–2004 National Homicide Monitoring Program (NHMP) Annual Report. Research and Public Policy Series. Canberra: Australian Institute of Criminology, 2005:13. Minino AM, Anderson RN, Fingerhut LA, et al.Deaths: injuries, 2002. National Vital Statistics Reports. Vol 54. Atlanta: National Center for Health Statistics, Centers for Disease Control and Prevention, 2006:32. Cockburn M. Poll shows enormous support for total ban: AGB McNair. Sydney Morning Herald. Sydney, 6 May 1996. Steketee M. Huge majority of voters supports bans: newspoll. The Australian. Sydney, 7 May 1996. Chapman S. Over our dead bodies. Port Arthur and Australia’s fight for gun control. Annandale: Pluto Press, 1998:61. Chan C, Gordon M. Howard victory on gun bans. Weekend Australian. Sydney, 11 May 1996. Chan G, Shanahan D. Howard praises Ministers’ decision. Weekend Australian. Sydney, 11 May 1996. Millet M. It’s thumbs up. Sydney Morning Herald. Sydney, 1 Mar 1997. Kreisfeld R. Indications of misclassification of causes of death. Personal communication (email to Chapman S). Adelaide: National Injury Surveillance Unit (NISU), 2006. Faltas S, McDonald G, Waszink C. Removing small arms from society: a review of weapons collection and destruction programmes. Occasional paper no. 2. Geneva: Small Arms Survey, 2001, 4. http://www.smallarmssurvey.org/files/sas/publications/o_papers.html (Accessed 21 November 2006). Cantor C, Mullen P, Alpers P. Mass homicide: the civil massacre. J Am Acad Psychiatry Law2000;28:55–63. Fox J, Levin J. Multiple homicide: patterns of serial and mass murder. Crime Justice Abstr1998;23.